The manager revealed today that he has already spoken to the player’s father. Declan Rice has impressed for West Ham in the Premier League this season. 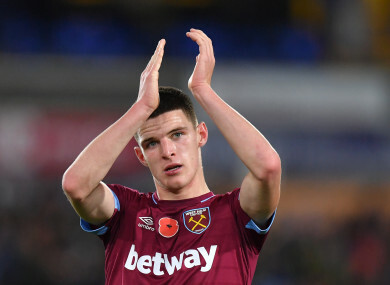 NEW IRELAND BOSS Mick McCarthy says he will meet with Declan Rice, as the West Ham star considers his international future. The 19-year-old represented the Boys in Green on three occasions in friendlies earlier this year, but made himself unavailable for recent Nations League qualifiers. The London-born midfielder, who qualifies for McCarthy’s side by virtue of his Irish-born grandparents, has recently spoken to England boss Gareth Southgate, as he considers declaring allegiance for the Three Lions having yet to line out for Ireland in a competitive fixture, which would tie him down to their squad. McCarthy, meanwhile, looks set to take a similar approach to previous boss Martin O’Neill in terms of dealing with this difficult situation, suggesting he would not pressure the youngster into making a definitive decision promptly. “I spoke to Declan’s father,” the 59-year-old coach said. “I had a good conversation with him. Just to clear up some things as well, some misconceptions — ‘Declan wasn’t here for the games because he had a fallout with Roy or with Martin,’ he’s got the utmost respect for both of those guys. “But, he was asked by Gareth Southgate to go see St George’s Park. And to see whether he could be enticed to go play with them. “He didn’t say he wanted to or didn’t want to. But he found it overwhelming. Meanwhile, McCarthy was unwilling to go into much detail with regard to what his approach towards the League of Ireland and its players would be. There were more squad call-ups from the domestic game during O’Neill’s tenure than any other Irish boss since Eoin Hand, who managed the team between 1980 and 1985. He added that he would speak with Dundalk boss Stephen Kenny in relation to the league, but played down suggestions that several players from the domestic game would be good enough to compete in the Championship. Email “Declan Rice will meet Mick McCarthy to discuss Ireland future”. Feedback on “Declan Rice will meet Mick McCarthy to discuss Ireland future”.